Passing all portions of the Alabama High School Graduation Exam is one of the requirements for receiving a diploma in the state. Although previously standards were much lower, educators began working diligently on curriculum and increased standards after the passing of the Education Accountability Law in 1995. Recognizing the need for Alabama's students to obtain an education comprised of more than just basics, the Department of Education has been consistently working towards what is known as a 4X4 curriculum for high school students, which includes four years of each of core courses in science, English, social studies, and math. This increased standard is reflected in the Alabama High School Graduation Exam, which has determined since 2004 that passing each of these components is a requirement for graduation. Students must pass the reading, language, mathematics, language, science and social studies portions of the exam in order to graduate. Individual school systems are responsible for contacting students regarding their scores. Passing the graduation exam is in addition to the required twenty-four credits of core academic subjects, physical and health education, arts, and electives that a student must complete. Students are actually offered six opportunities to complete and pass the graduation exam, beginning in tenth grade with the pre-graduation exam. Five subsequent opportunities are available, including spring of grade 11 and summer prior to the student's senior year. During the senior year, the student can take the exam in fall, mid-year, or spring. Each portion of the exam can be completed at a test date after the student has completed the required classes for that subject. The exams take place over a week-long period and allow for approximately three hours each day for testing, although special provisions may be made for students who require additional time to complete their test. Each subject test is comprised of 84 to 100 multiple-choice questions. The test is written at the eleventh grade level. Test taking is just one of the difficulties in adolescence teens face. Fortunately, there are a variety of ways for Alabama students prepare for the high school graduation exam. Diligence and attentiveness in classes is one of the most important ways for a student to have the knowledge needed for passing the exam. Every Alabama student will receive a booklet detailing the requirements for the Alabama High School Graduation Exam, and students and parents should familiarize themselves with the requirements. Alabama also employs a program called "Pathways for Learning" to assist teachers in providing the information and learning strategies important for passing the exam. Prior to and during test week, it's important for students to get plenty of rest, eat nutritious, balanced meals, especially breakfast on test days, and practice simple stress-relieving tactics, such as deep breathing, to relieve test-taking anxieties that may surface during the exam. The state of Alabama offers the "High Hopes" education program that provides tutoring and extra help for students who have taken, but not passed any portion of the exam. In addition, individual schools may employ exam preparation programs of other remedial exam help. 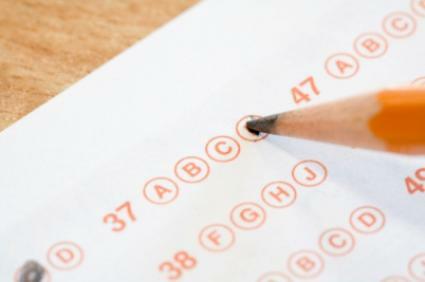 Schools may choose to offer practice tests, like the Alabama Student Review Guides available from Enrichment Plus, to help students be familiar with the types of questions and format of the test. Students should take advantage of practice tests and test preparation if offered in at their school. Students can also prepare by practicing good guessing and deduction skills. It's better for the student to take the most accurate guess than to leave the answer blank. There are several alternatives for students who are unable to pass Alabama's graduation exam. Students who have completed all class work may continue to retake the exam until age 21 in order to earn his or her diploma. An Occupational Diploma may be issued to qualified students. Although the thought of taking their high school graduation exam can be nerve-wracking for Alabama students, the majority of students pass successfully. By applying themselves to their class studies, familiarizing themselves through the pre-test or practice tests, and being well-rested and prepared for test week, students can do well in this step towards graduation, higher education, and teens' future career planning. For more information, review the Great Expectations Guide to the Alabama Graduation Exam online, or visit the Alabama State Department of Education website.